May 18, 2018 (The Radiance Foundation) – It definitely didn't turn out exactly the way I had expected. But I'm still grateful for it all. Adversity is incredibly illuminating. I was invited to share my story of adoption at Vicksburg High School, a public school, in Michigan. I submitted an outline for the 'Life Has Purpose' presentation and the principal of the school, Keevin O'Neill, approved it without any changes. Students reacted positively, laughing, clapping, and engaging throughout the whole assembly. I even had three rounds of 'Q&A' where students came up on stage to compete for free iTunes gift cards. There was no obvious opposition during the assembly. Of course, I'm not naïve. Even though I was not political and never mentioned off-limit "trigger" words, I know that even the mention of adoption can send some pro-abortion advocates into a tailspin. That spin started the moment I finished. The same principal who had approved my adoption-centered outline, who wasn't present at the assembly, did what he told me in a lengthy phone call was "politically correct". He threw me under the bus. Less than 24 hours after my multimedia talk, the school issued a public statement, via school-wide email and Facebook (they've since deleted the post), falsely claiming it was "overtly political". On Facebook they reinforced their original post with another reply stating: "We can assure you that the message that the High School had agreed to through repeated contacts with the speaker was one of inspiration, motivation, and unity. The actual content of the presentation was not in keeping with that agreement." Twenty four hours after the presentation, the outgoing Superintendent – Charles Glaes – took to local news (here and here) to smear me and The Radiance Foundation, declaring that "if you go beyond what was heard and look at the [Radiance Foundation's] website, lots of people are going to be very alarmed." Got it. If you're a Christian who actively employs faith, reason and compassion into your life-affirming work, you're not suitable public school speaker material. But if you're a public school administrator, you can lie with impunity. 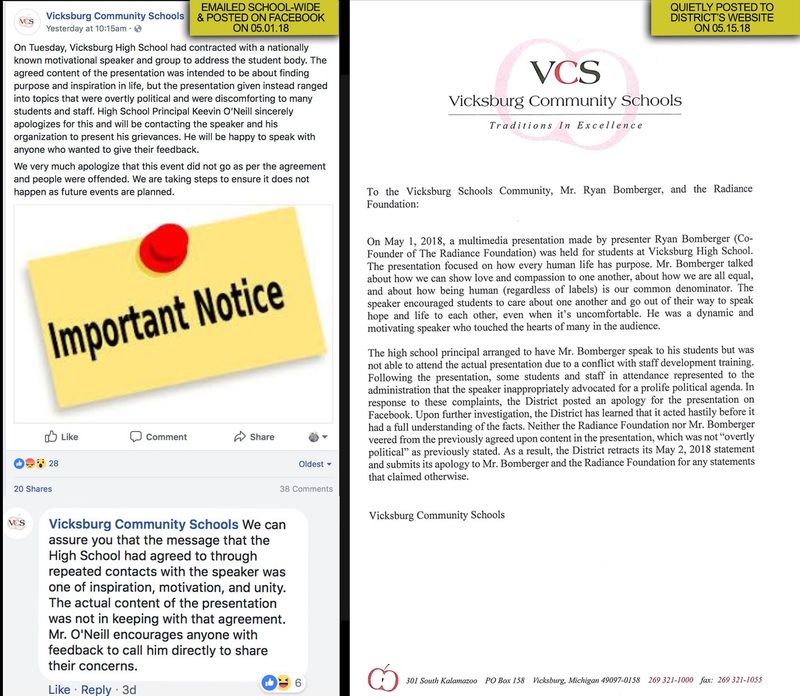 After sending a Cease and Desist letter from our attorney, the Vicksburg Community School District responded within 24 hours with a draft apology. They quietly posted the final version of the apology – admitting what they previously posted was untrue – on the district's website on May 15th. Unfortunately, they refuse to communicate the truth by the same means (school-wide email and Facebook) in which they spread the lie. They couldn't have students and parents know how poorly they handled this situation. They couldn't have the public know they'd rather defame an outside speaker than stand with integrity and honor behind someone who inspired students and staff with a life-affirming message. Instead, they chose to appease a vocal and venomous minority who aren't concerned with the facts, who aren't concerned with tolerance, and who aren't concerned that they demonize those with whom they disagree. I called the principal the day after the school's defamatory Facebook post; it was both enlightening and enraging. He kept agreeing with me that what the school posted was not true and that it emboldened some students and parents to promote a false narrative of what happened. He praised me and the presentation, saying: "I want you to know that I've had so many students come to me and tell me how your message was received in a positive way and how much they appreciated your message and how much they enjoyed your personality, your story, how much they appreciated the way you treated everybody." Then O'Neill said this: "I agree. I am so sorry about all of this…I truly apologize that our apology could be taken, I guess, could be taken that you guys lied to us. I think it had to be put out there in a politically correct way to counter some of the stuff that was coming at us. I truly understand where you're coming from…We made a mistake to some of the wording in this posting. It was in response to a lot of the negativity I was taking here. But you are correct. You truly are correct. The post never should have gone out." This goes to a much deeper issue than this public speaker being thrown under the bus for "political correctness". How much does your public school lie to you as the parent? They got caught this time in a needless huge deception. This undermines the credibility of those tasked with the awesome responsibility to shape your child. This sheer lack of honesty, integrity and responsibility matters. Yet in our society, we expect far less from our elected leaders, pastors, and public educators than we expect of ourselves. Why? Character should always matter. Seven days after the public smear of my reputation, that principal was appointed as the new Superintendent. What if he had not been "politically correct" in this situation? Would that have impacted his new appointment? I don't ever want to be politically correct. It's an oxymoron. I want to be morally correct. When torn between what's right and what's wrong, I pray for the fortitude to do what's right and good – no matter the circumstances.